Perhaps you want to promote an idea, a project, or a concept. Maybe you are looking to create a more compelling message to sell a product or service that will help you access challenging decision makers. Whatever your purpose–be it professional, academic, political, philanthropic, or personal, you can learn to craft a fresh, brief, and persuasive message that generates tangible results. 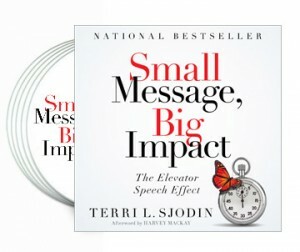 This audio set also includes a data disc with outlines to help you craft your next talk, worksheets, a complete sample elevator speech, evaluation forms…and much more! Total Playing Time: Approximately 4 hrs.